Hello again, our lovely Readers!!!!! Today's novel stands out among its peers. 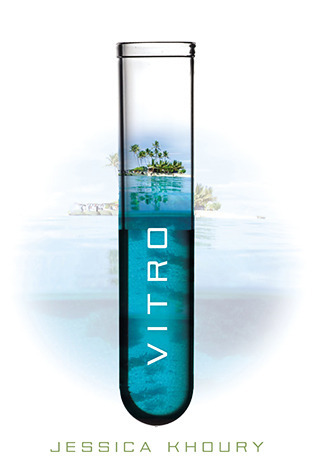 It's Vitro by Jessica Khoury! Summary: "On a remote island in the Pacific, Corpus scientists have taken test tube embryos and given them life. These beings—the Vitros—have knowledge and abilities most humans can only dream of. But they also have one enormous flaw. This novel is really interesting. Not only does it bring up the topic of who family truly is, and what ethical lines should or should not be crossed in science, particularly when it involves human lives. Also, what/who is or is not considered as human. It's a very good novel, toying with all of these ideas, plus adding in these characters that yank at your heartstrings or make you want to be empowered. This novel is seriously one of the best books I've read in awhile, especially with the subject of science and scientific breakthroughs. This novel has it as happening now, whereas you're usually overwhelmed with this futuristic new world full of technology. The plot is awesome and interesting, and you'll never guess what comes next on every page! This novel is truly great! In Conclusion: If you like action-packed novels that make you think, read this ASAP!